Are you one of those moms that’s never in photos?? Whether it’s because you are always behind the camera or we just don’t feel good about ourselves, as mothers we need to be present in our children’s photos. Put those feelings aside and make some sweet memories with your precious babies. They will love and cherish these photos in years to come. Studio remodel will be done by next Saturday and it will be ready for these sweet Mommy & Me sessions. These will be relaxed sessions and neutral clothes is suggested to focus on the emotion we capture between you and your sweeties. These sessions are 25 min sessions in the studio or outdoors for you and your children. A box of 10 printed 4x6s, 10 corresponding digital images and (1) 8x 10 is included. Session fee is $150 + tax = $162.35 and a deposit of $62.35 is required (Savings of over $145!). The remaining balance of $100.00 is due the day of the session. You may pay your deposit HERE. And because I feel this is such an important moment for us Moms and children to have, I am giving away one session!!!! Make sure to LIKE our facebook page HERE and comment below the names and ages of your children!!!! 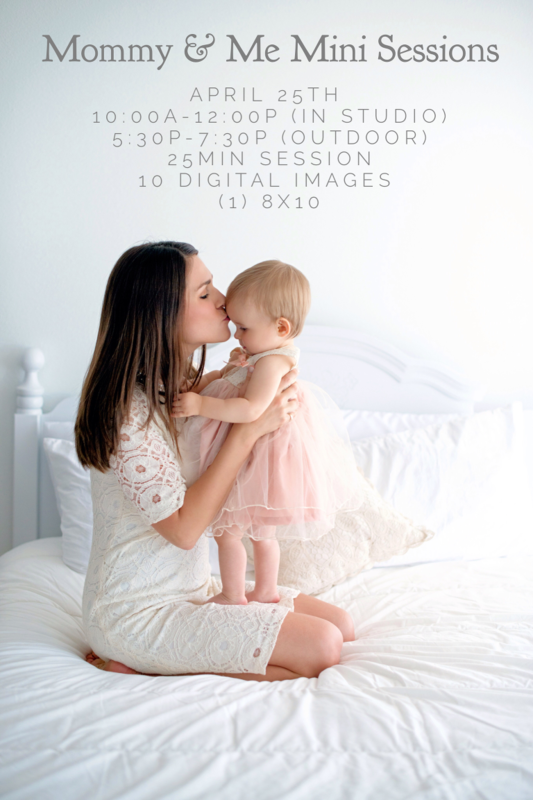 One lucky mommy will get the chance to win her own session!!! Contest EXTENDED***will end at 11:59pm Friday May 1st. seems robledo - I would love to win one of your beautiful sessions with my kids..
Lindsey Pelton - Such a sweet idea! Adrienne Gutierrez - I would love to win and document these moments with my kids. Jenny Howard - I would love to win one of these special sessions with my children.